How’s everyone been doing? I was planning on attempting a video blog but seem to have misplaced my tripod. Maybe next time. There have been several events in the reptile world recently. First, the comment period for the newest listings on the Lacey Act has closed. The site shows a pitiful 4100 comments. In my opinion, among a hobby with millions of participants, this is a VERY discouraging outcome. Take away all of the uninformed, ban them all comments and the number is even lower. If HSUS truly has the 23,000 signed comments they are claiming, we’ve rolled over and played dead. At least the online comments seem to show more supporters of our opinion than the other sides. With the exception of Florida citizens, who seem to think this is an outright ban on owning snakes, and a few odd comments out of Hawaii, where all snakes are already illegal, most of the comments were against listing any more species. Several of them were very well written, showing in depth knowledge and research. Unfortunately, quite a few weren’t so well worded. Telling a legislator that “This is stupid” isn’t going to hold much sway. One guy even suggested banning all snake ownership, setting up a way to surrender the newly illegal animals, and turning them all into belts, boots and jackets! Either way, it is now in the hands of our elected officials. All we can do is hope for the best but prepare for the worst while they decide the outcome of this entire mess. On a brighter note, West Virginia has realized that their all inclusive list of anything not domestic canine or feline was a bit overboard. The Chairperson of the WV Dangerous Wild Animal Board has suggested that they should scrap the present list and adopt one more similar to Ohio’s. While this isn’t great, it’s better than a list of reptiles sixty-some pages long. 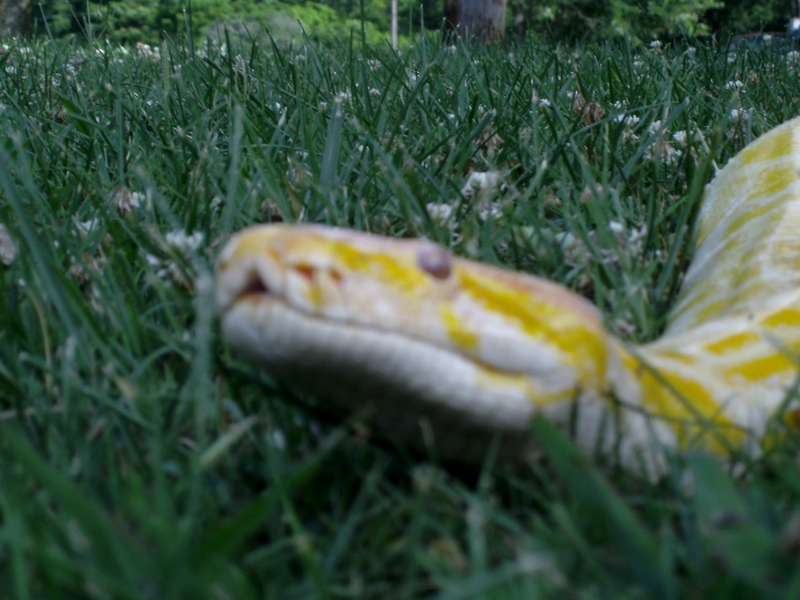 Unfortunately, she would like to see Ohio’s restrictions on snakes over 12 feet applied to any over 6 feet. At least we can see some evidence that public comments can sway state legislator’s. Another action, which has been viewed as a positive for reptile owners, was Illinois Governor Quinn signed into law the Herptiles Act. This moves herps into a separate category from other exotic animal laws. This law will supersede any other laws on the books and eases some of the more controversial issues from the recent changes. Turtle owners appear to benefit the most from these changes. On the home front, Felita and I recently had the opportunity to visit a Vacation Bible School with some of our animals. Yes, we took snakes to a Pentecostal church! The children were fascinated with our boas, balls, beardies and Leos. Padme, our iguana, was a pretty big hit also. Unfortunately, in the 25 miles between us and the church, there lies the Tennessee/North Carolina state line, so our Burms had to stay home. The woman who arranged our visit teaches in the Greene County School district, so hopefully we will be given bigger and better local opportunities. A few weeks prior to this, we were able to visit the local 4-H camp and teach children about reptiles. As a direct result of this visit, we had a male Iguana, who we named Anakin, surrendered to us. While his social skills are not up to par, he is a welcome addition to our family. We are looking forward to attending the first ever Reptiday in Chattanooga on August 9th. Reptiday is the new, single day, format that Repticon has adopted for areas that don’t have the attendance to support a 2 day event. Hopefully this will work out better for the promoters and vendors alike. Vendors can’t afford to set for a second full day if the sales are not there. We are confirmed for a table as well as presentations so if you can, come join us. If you would like to hang at the table and help talk to the public about the animals we love, feel free. If you have an animal, which does well in crowds, that you would like to show off, bring it with you. We will have boas, balls, beardies and probably Padme. I know several of you also do presentations to the public. Right now, this is our best approach at changing public opinion. If you would like to borrow a banner, need some CHET literature or just advice on how to handle things, let us know. Petco’s new reptile night appears to be a great opportunity for several of you. Feel free to share your pics and stories. If anyone is aware of other opportunities please share them. Sadly, due to issues in her personal life, Hollie Dennis has been forced to step-down as Middle/West Tennessee spokesperson. Greg and I are looking at options to strengthen our presence west of the Plateau. We hope to be able to announce new admins in the Nashville, Memphis, and possibly Chattanooga regions before much longer. As of right now, our main support base seems to be limited to Knoxville and the Tri-Cities due to geographic placement. We are still focused on Statewide influence and we continue to discuss our options for improving our representation in the other regions. I will continue to try and keep everyone up to date on our future activities. Until next time, Happy Herping.